We are quite a BIG DEAL in the world of Dupont! You know, Dupont, the miracles of science! Kirk and North Valley Mechanical are featured in the case history attached and on their website! Kirk decided to try ISCEON® MO99™ on a retrofit of a residential package heatpump a Goettl 2.5 ton with a leaking indoor coil in May 2012. The 2.5 ton Goettl Model HP 305J was a 12 SEER unit and dated back to the early 1990’s and locating parts was going to be difficult. Kirk devised a plan to try to retrofit the unit to DuPont™ ISCEON® MO99™ refrigerant as a last attempt to salvage the unit. He knew it was going to be difficult since Goettl closed their manufacturing facility and parts are no longer available for the unit. There were not many options available to fix the unit. The coil needed to be replaced, and a new coil was not available. A custom created coil could be purchased, but it was cost prohibitive to do so. Buscho identified another shape of coil that matched the size of the old coil in both volume and tonnage and Robert Forbes, field superintendent, assembled the unit including placing air baffles on each side so that air would flow through the coil. The new coil was equipped with an R-22 TXV versus an orifice. 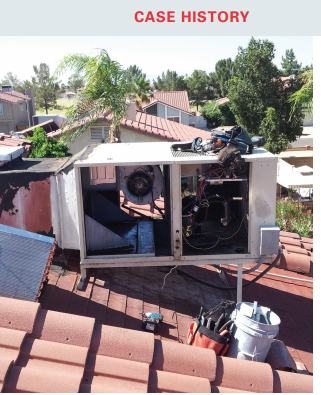 In a conversion using ISCEON® MO99™, the steps to complete the process include recovering the R-22, replacing the critical seals, charging the refrigerant, restarting and monitoring the system for potential leaks. On a package or split system you’re only replacing valve cores and the valve caps as they have elastomeric seals. We’ve discovered no need to replace Teflon® or nylon rings.